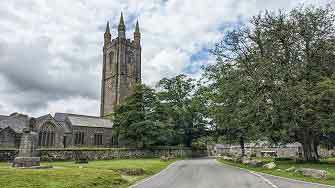 Widecombe (willow valley) is well known for its Fair,gift & tea shops and pubs. Take the in places narrow B3387 from Bovey Tracey past Haytor. A very pleasant walk involving some climbing. Near Bonehill Rocks you take a track on left - here Spielberg shot some of his scenes for War Horse. 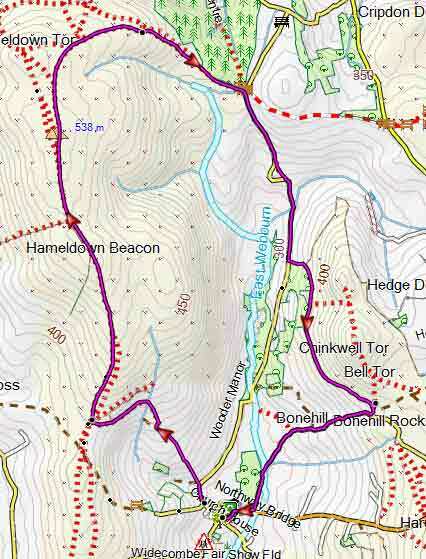 You can avoid the climb to Chinkwell Tor by continuing along a track keeping Tor on your right. Other Tors which can be explored are Bell Tor and Honeybag Tor. During the bronze age Grimspound ,made of granite blocks ,enclosed 24 hut circles,suggesting a milder climate and an abundance of trees. Two popular walks. 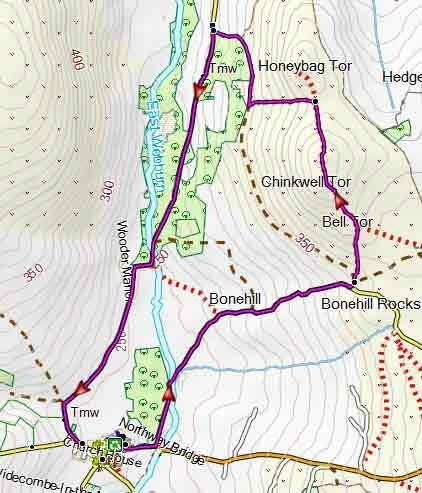 One of our most popular walks following part of the Dartmoor Way along the river Ashburn. This somewhat strenuous walk with spectacular and extensive views follows part of the Two Moors Way. Hameldowon Cross is the highest cross on Dartmoor dating back to the middle ages. From here,cross moorland in an easterly direction towards a well trodden track. We recommend this walk when no rain has been forecast.